Bole2Harlem: Hearing Ethiopia in New York In the '70s, Ethopia's capital, Addis Ababa, was awash in a hypnotic blend of Ethiopian rhythms, American jazz and European pop. When the ruler Haile Selassie died, so did the music scene. Now the Ethiopian sound is re-emerging — in New York. A song based around taxi culture in Addis Ababa: "We took the bus from Bole to Harlem!" This chant comes from a fun and popular children's rhyme. In the 1970s, the Ethopian capital of Addis Ababa was awash in a hypnotic blend of Ethiopian rhythms, American jazz and European pop, concocted by military and police band members moonlighting in the clubs and hotels of the metropolis. When the ruler Haile Selassie died, so did the music scene, as the dictator Mengistu Haile Mariam took power and many fled the country in the ensuing "Red Terror" of the late 1970s. Now, 30 years and 7,000 miles later the Ethiopian cafe society sound has returned. At the New York city restaurant L'Orange Bleue, African expatriates and others began swapping ideas in informal jam sessions. 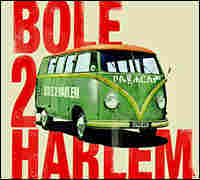 Producer David Schommer saw potential in that meeting of musical minds, and the group Bole2Harlem was born. Bole is the main airport in Addis Ababa. The group's music, collected on a new CD, is a tapestry of influences from the Ethiopian music scene of the '70s and its diaspora. The exiled dictator Mengistu, who silenced his country's golden age of music, was recently found guilty of genocide after a 12-year trial. Thankfully, the music never died.